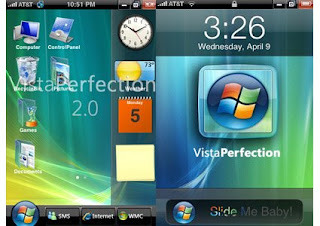 If you are a fond of Windows Vista, now you have opportunity to have it even on your iPhone. Vista Perfection 2.0, a vista based iPhone themes convert your iphone interfaces like Vista look and feel. Once installed you will have Vista wallpapers, sliders, sound effects, vista icon, and even start menu. Since it is a theme, it won’t break your iPhone apps. The most impressive of Vista perfection is the booting and shutdown screen with a support background processing screen. Plus more, the WiFi icon, EDGE icon, and even the slide to unlock arrow have all been themed as well. Vista Perfection iPhone theme features: Over 90 Icons; better and Sharper Dock Icons; Wifi Icon; Boot and Restore Images; Categories Icons; Vista Login/LogOff (Unlock/Lock) Sound Scheme; Badges and Sliders; Revamped TaskBar; LockScreen Wallpaper and much more. VistaPerfection was created by Spec Works. To use it you will need jail broken iPhone, SSH access and SummerBoard. Go to ModMyIfone for complete instructions on how to download it.